Shirts With Random Triangles: South Carolina adds RB prospect A.J. Turner to its 2015 recruiting class. South Carolina adds RB prospect A.J. Turner to its 2015 recruiting class. South Carolina had added the 20th member to its 2015 recruiting class. 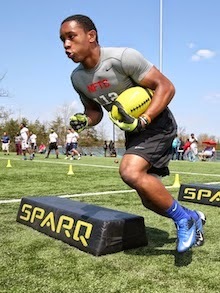 Clifton, Va. high school rising senior running back A.J. Turner committed to the Gamecocks while attending The Opening football camp in Beaverton, Or. on Thursday. The 247Sports.com composite intangibles for Turner are as follows: Turner is rated as a three-star running back. He is ranked 27th among 2015 RB prospects. He is ranked 13th among 2015 prospects in Virginia, and is ranked 342nd among all 2015 prospects in the U.S.
Turner attends Cerntreville High School in Clifton, Va. He stands five ft., eleven in., and weighs 180 pounds.